(Recto) lower right, in pencil: "Man/ Ray/ Paris"
(Verso) wet stamp: "Man Ray / Paris...8 rue Val de Grace..."
(Recto) inscribed in pencil: "Paris." 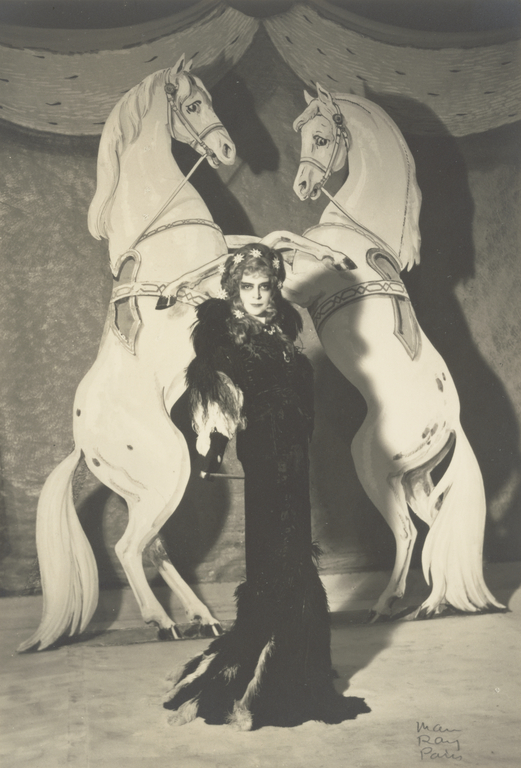 One of Man Ray's earliest portrait commissions in Paris came from the Marquise Luisa Casati, an eccentric Italian aristocrat who was an important patron of vanguard artists. Casati's audacious hair and makeup were part of the fantastical world she constructed, which included a taste for extravagant clothing, interior design, costume balls, and pets. Her masquerade costume here represents her as the Empress Elizabeth of Austria. During the 1920s, Man Ray photographed her at home in her salon, surrounded by her favorite objects, and used a drawing of another photographic portrait in a still life. Man Ray, American, 1890 - 1976, sold to Arnold Crane, before 1973. Ray, Man. Self-Portrait (London: A. Deutsch, 1963; Boston: Little, Brown, 1963). Ray, Man. Man Ray: Photographe, mit einer Einleitung von Jean-Hubert Martin (München: Schirmer/Mosel, 1982), pl. 310.